$240,000: estimated amount needed to raise a child from birth to age 18. 35% of mothers of children with autism earn 35% less than mothers of children without autism. 8% of kids under 15 in the United States have some sort of disability; 1/2 of those are considered severe. Before 1975 more than a million students with disabilities were excluded from schools and 3.5 million did not receive appropriate special education services. 18 percent: Federal government now pays 18% of the $50 billion spent annually on special-education services required by IDEA. 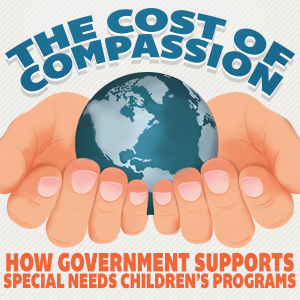 On average, a family with a special needs child has $774 in additional expenses each year. $562: Out of pocket extra cost per family in Massachusetts, the least out of pocket of any state in the U.S.
State and local support of special needs kids varies: from 3 percent in Oklahoma to 90 percent in Wyoming; local contributions range from 0 percent in Wyoming to 80 percent in Arizona. Why the Growth in Program Costs?